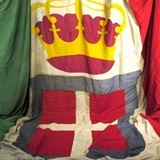 Italian Royal Army combat flag. Pennant 605th company gunners of the M.V.S.N. Tip for Savoy flag 18th century.